You will enjoy a privileged, strategically-located setting: a place where routes cross and yet which remains just a twist of the throttle away from the great metropolises of Barcelona and Madrid. You will be far away from the crowds, at a place where routes meet on a map that stretches from an endless plain to mythical summits of perpetual snows. You will also remain just a step away from the rest of the world, thanks to such modern facilities as the high-speed train and the Lleida-Alguaire and Andorra-La Seu d'Urgell airports. You will ride through a friendly territory which receives travellers with all the pride of well-conserved tradition, built upon generations of hospitality. In fact, you will feel completely at home as soon as you set foot in Lleida. So come and discover the comarques (local districts) of Lleida with your friends or family and enjoy an invitation to savour the most authentic aspects of this unique country. Its two main tourist brands: the "Lands of Lleida" and the "Pyrenees", present the perfect umbrella under which to offer the best natural, gastronomic, cultural and heritage treasures. Nature is a concept that is inseparable from the Lands of Lleida. All along the way, the route will tempt you with endless plains, vertiginous landscapes, hills, colourful woodlands and summits that lie lost in the distance. As you calmly ride across the plain, you can enjoy an explosion of fruit trees and crop fields. Let yourself be captivated by the natural adventure offered by the Ivars and Vila-sana pool and by the confluence of the rivers Segre and Cinca; these are two watery gifts that stand in the middle of the Lleida plain as an invitation for visitors to relax. You can also travel through the Pre-Pyrenees, beneath the magnificent walls of rock that seem to stretch out to touch the sky in the Mont-rebei gorge (which is a Starlight destination), the Collegats-Terradets Park and the Boumort reserve. In this shaded part of La Noguera and El Pallars Jussà, in a territory dominated by stone, rivers and sky, you can stop for the night at El Montsec to enjoy the mystery of the stars at its Astronomy Park, which has been recognised by UNESCO as a Starlight Reserve. Seduced by streams of seemingly never-ending tarmac, you will then reach the old Pyrenees, where the dream worlds of our forebears still seem to live on, guarded within three natural parks: the Aigüestortes and Estany de Sant Maurici National Park, which is the only National Park in Catalonia; the High Pyrenees Natural Park; and the Cadí-Moixeró Natural Park. 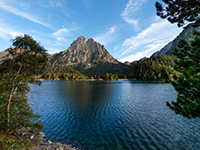 The Aigüestortes and Estany de Sant Maurici National Park does more than any other area to introduce visitors into the labyrinthine universe of water and wildlife that lies beneath the glaciers of its highest peaks. In this lofty destination, the adrenaline of speed will no doubt encourage you to enjoy a day's skiing at one of Lleida's eleven ski resorts. In fact, this territory boasts one of the most important professional networks for skiing and adventure sports to be found in the whole of Spain, with the presence of 200 specialist companies. If you cannot find adventure here, you will not find it anywhere! Skiing and action sports offer the ideal complement for long days on your motorcycle. The Val d'Aran is another of the treasures offered by the Lleida Pyrenees. This valley will greet you with the unequalled mixture of tradition and sustainability that have ensured its recognition as a Biosphere Destination. In the Atlantic valleys of Aran, you will find age-old villages and welcoming people who will help you along your route with their excellent tourist services. They are already an internationally-known reference, so you will have no choice but to stop here, take off your helmet, admire the countryside and place yourself in the hands of the local people. 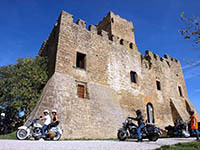 This explains why the Pyrenees and the Lands of Lleida carry the "Moturisme AraLleida" stamp of approval, which recognises establishments that specialise in welcoming motorcyclists. Here, you will find houses full of warmth that provide the body with pleasant relief after the rigours of the route. And once you have recharged your batteries in the peace and quiet of the rural hamlets, there is the city of Lleida, which will seduce you with its human-scale urban attractions and where everything is at hand and there is no need to queue. The bewitching route through the capital will take you to the watchtower of the Seu Vella (Old Cathedral) and also to the Knights Templar Castle of Gardeny, where you will be able to look out in awe over the great platform of the comarca of El Segrià. The lively streets of the city centre also offer details full of history, including buildings with Art Nouveau-style façades, as well as more modern proposals, such as the La Llotja congress and conference centre. Gastronomy is an important factor that distinguishes each area of Lleida, giving it its own particular personality. The villages and the people who live in them are waiting to greet you with designation of origin products that include: the cheeses and butter of L'Alt Urgell and La Cerdanya; the pears of Lleida; and the olive oil of Les Garrigues, which is pure, liquid gold and will reward your palate with the smooth taste of this territory. You will return to the road with renewed strength after sampling the natural products from the local territory, which also include: the veal of the Pyrenees; the wines of Costers del Segre; and the almond nougat of Agramunt. They represent a land that you will now regard as almost your own. The Lands of Lleida: a thousand journeys at the twist of a throttle.